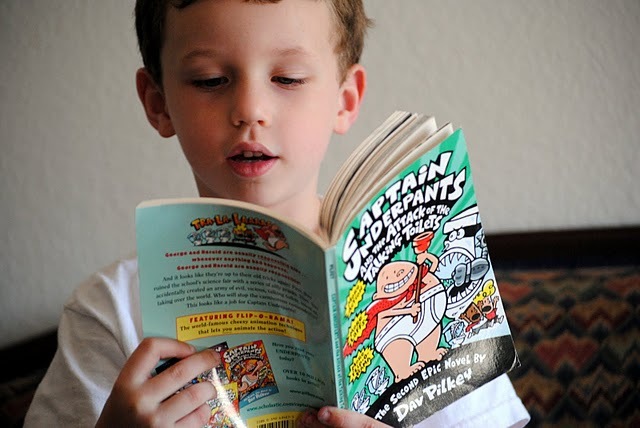 To say that Luke is obsessed with Captain Underpants is an understatement. Those of you with boys who can read, you know what I am talking about. Those of you who don’t, you will learn shortly what this is all about. 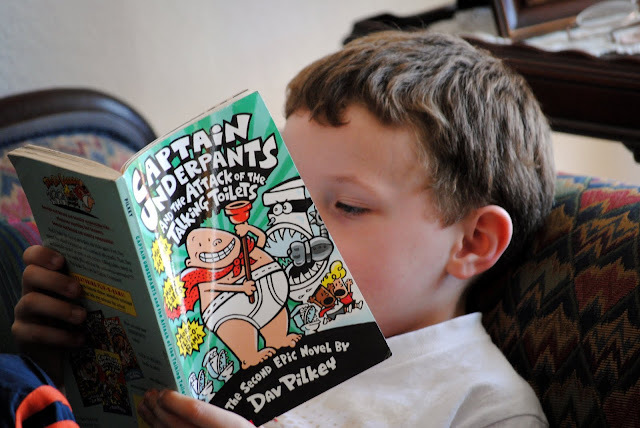 And if by chance you do have boys who can read, and did not previously know about the Captain, and his underpants, once you are done reading this, you must go buy your son some of these books. Luke has latched onto these books like bees to honey, stink on a dog, flies on cows. He generally reads each book in about 24 hours and then is quite persistent on obtaining another one. And if he gets one out of order, this throws him off a bit. He does however recover and moves on in life. 1. He opens the book to the table of contents so he can determine exactly how many chapters and pages the book contains. There are usually 20 something chapters and about 140 something pages. He will then go on and on about this as if it will actually take all the energy and life out of him to read this much. 2. Once he is done talking about how long the book is; he then reads the table of contents to find the Flip-O-Rama chapter. What is Flip-O-Rama you ask? Well, let me tell you. There will usually be two or three different ones, but each one contains two pages. You quickly turn the page back and forth and some ridiculous scene will be playing out before your eyes—something along the lines of a toilet eating a person or something else equally weird, gross, and boyish. 3. Next up, he must read the title page of the book to determine who wrote it. Now, this may sound a little dumb since it is a series of books. One would think the same person would have wrote them all. Nope. 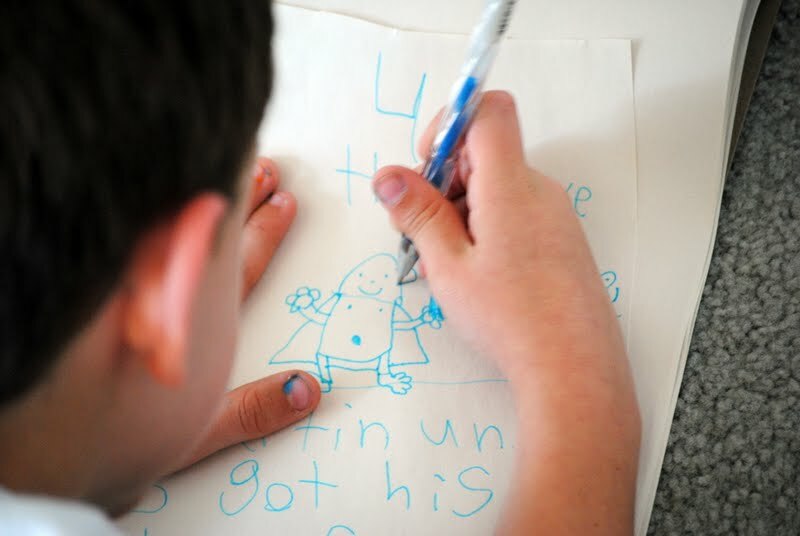 Upon inspection, you will note that Dav Pilkey wrote the first one. 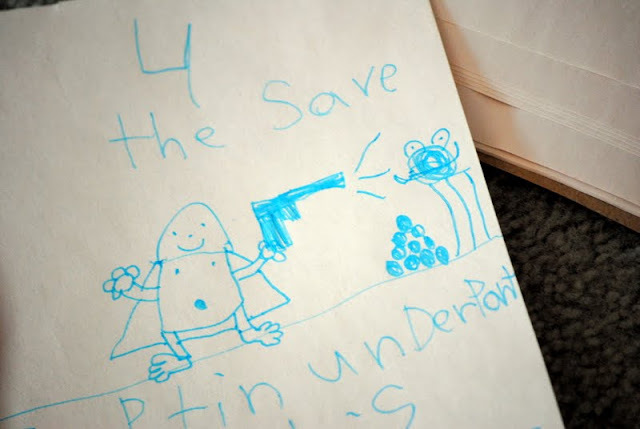 However, if you look, Dav did not write the fourth one, Captain Underpants and the Perilous Plot of the Professor Poopypants. While is name does appear on the title page, it is mysteriously marked out and next to it, it states that Gidget Hamsterbrains wrote it. Now Luke must determine who is writing each book before he can move on. 4. Finally, after all of this, he will then begin reading chapter one. And these books contain gross boy stuff. Now, just loving and reading these books does not make one past the point of obsessed. You need more. 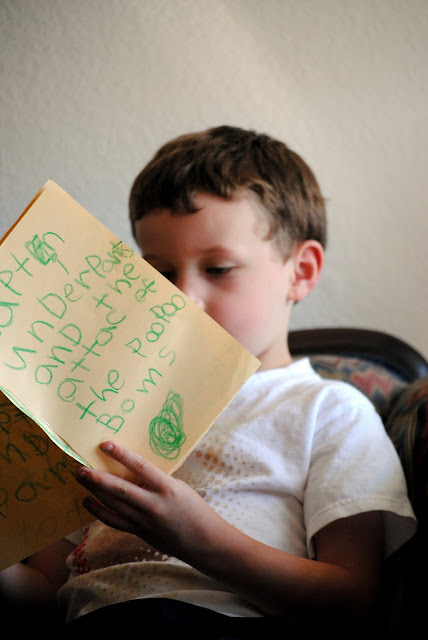 Not only does Luke love reading these books, he loves writing his OWN Captain Underpants books. Please do not contact Dav or any of the other cast of characters who are writing and publishing these books and turn Luke in. I promise I will not let him run off to some publishing company, books in hand, and try to sell them. 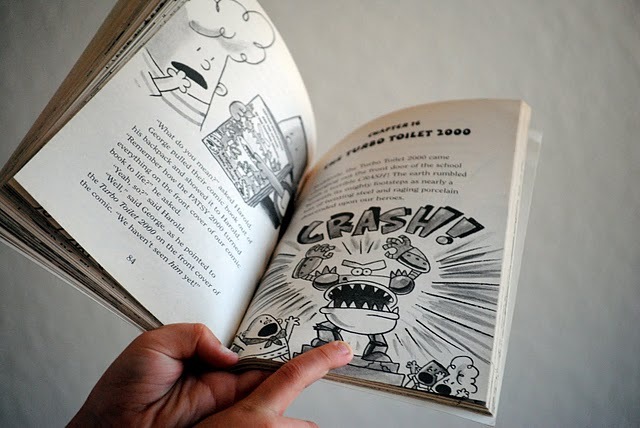 A sample of Luke’s books-- The Adventures of Captain Underpants and the Poo Poo Boms (aka bombs). I was not real sure I wanted to hear about this book or see it. But, as his Mother, who likes to support creative thinking and writing, I felt I should. So far I think this book has four chapters. One would think that would be all it would take to blow up some poop, but I guess it might take longer. Okay, so we have established that Luke loves to get these books, read the table of contents, play flip-o-rama, determine who wrote the book, read them, AND write them. But that is not all. Oh no, my friends, there is MORE. Luke also IS Captain Underpants. 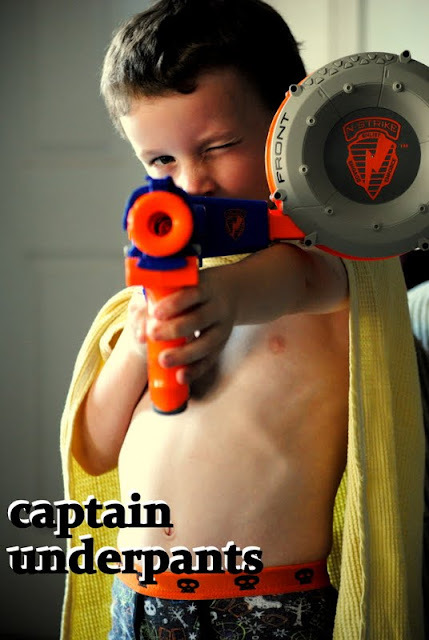 At any given time, The Captain, as I like to call him, can be found running around our house shooting any and everything that he can. Including his Mother. Who again, supports creative thinking and play so she just smiles and thinks to herself, one day, I will get you when you least expect it. So, as you can see, this boy is beyond obsessed. I was not joking.